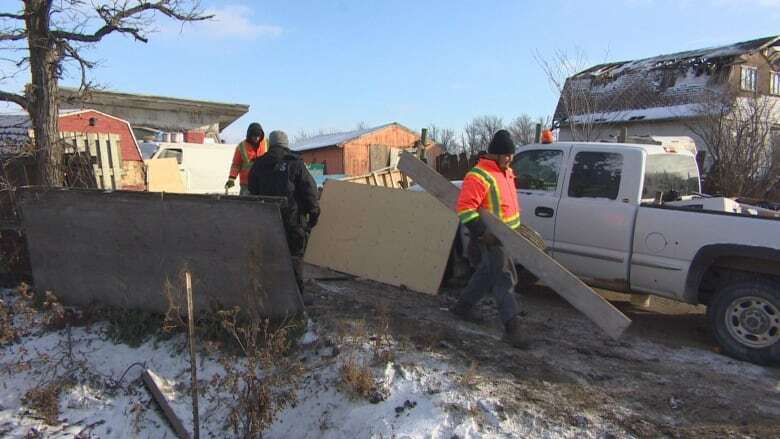 A group of onlookers watched in surprise Tuesday as about a dozen Winnipeg bylaw officers and animal services staff converged on a ramshackle south St. Vital farm to remove miscellaneous debris and kittens. "They're finally doing something about it," said Tami Luschinski, who lives near the property on St. Mary's Road past the Perimeter Highway at the outskirts of the city. 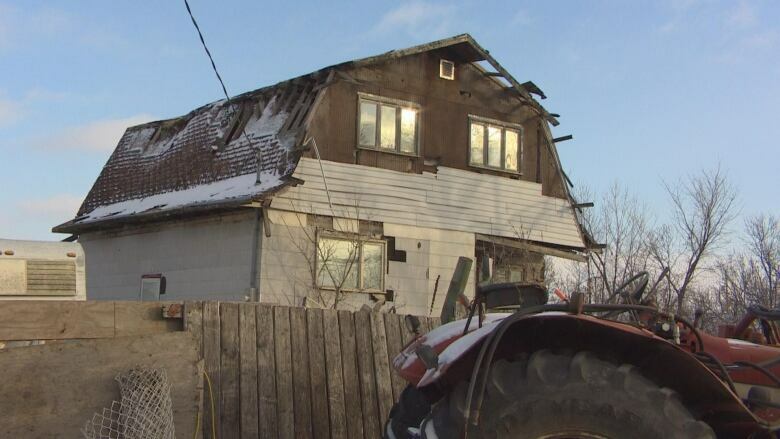 An old farm house on the lot was recently deemed unsafe and ordered to be demolished, according to the city. Large holes could been seen in the roof and side of the building; old vehicles were scattered across the property; upwards of 30 pigs and cattle were visible from the road; and a makeshift fence of plywood and odd items ran across part of the front of the yard. It's unclear whether any of these things in particular is what brought the city to 72-year-old Carl Kucas's farm on Tuesday. Kucas's lot is classified as rural-residential. Typically that kind of lot doesn't allow landowners to keep livestock, but Kucas has retained rights to do so since he bought the land in the 1970s, a city spokesperson confirmed. He said police arrived around noon and asked him to come with them. Winnipeg police were assigned to help execute a safe neighbourhoods and livability warrant because Kucas wasn't letting bylaw officers onto his property, Const. Tammy Skrabek said. Officers spoke with Kucas in a police vehicle and he was taken to a family member's house during the cleanup, she said. A city worker scooped away large heaps of dirt and debris with a front-end loader, while others dismantled the makeshift fence. 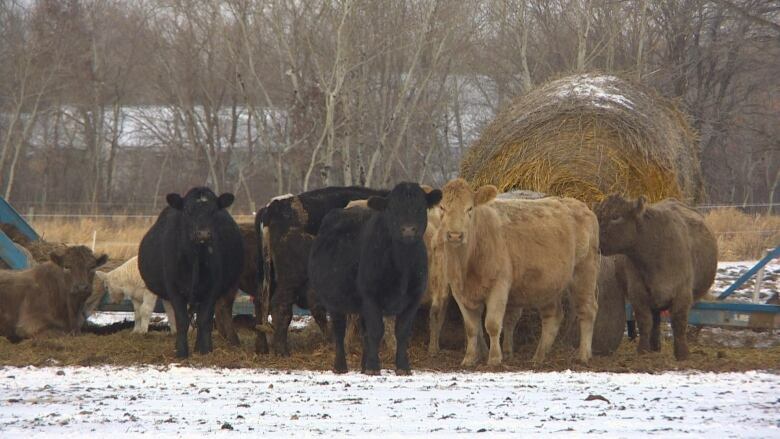 Kucas said he was worried the presence of so many city workers, tractors and activity could spook his pregnant cows and cause them to miscarry. 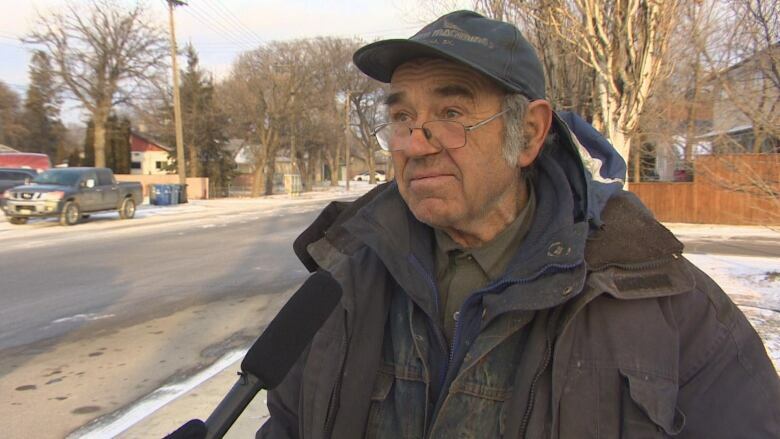 "It's awful," Kucas told CBC News outside a coffee shop a few minutes away on St. Mary's. "Now they are in there with no food, with nothing there and they're running all over the place. Now they're [the city] going to come and blame myself for it, that I don't take care of them." A city spokesperson said in an email that officials visited the farm in response to a "compliance order" on the property and declined to elaborate. Luschinski said she had called the city and province to complain about the lot in recent days — one of several complaints lodged by locals over the years. In 2010, he was ordered to remove about 20 derelict vehicles, a tractor, bathtub, hot water tank, scrap metal, tires, old appliances, manure and "miscellaneous garbage" cluttering the six-hectare pig and cow farm. Neighbours also complained about the smell of the farm back then, and still do. This past summer, complaints were raised with Manitoba's provincial veterinarian over concerns about a number of stray cats that lived on or near the property. Several similar complaints have been made since, according to a provincial spokesperson earlier in November. Cat owners have been required to license their felines in Winnipeg since 2015. 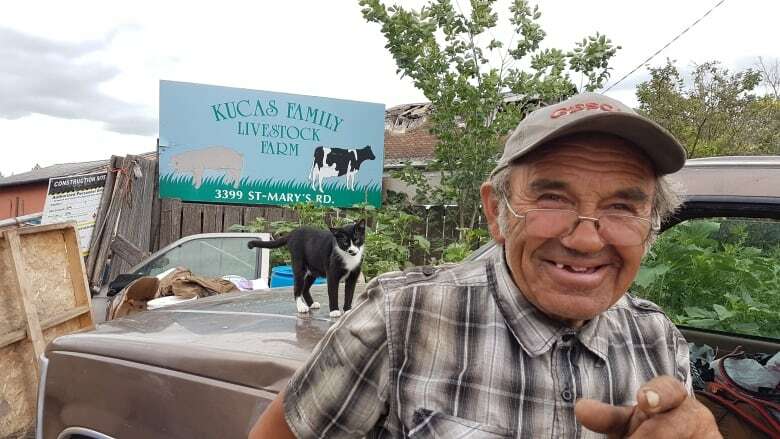 Kucas doesn't technically claim ownership of the cats, though he says he does feed them and they keep rodents and pests from invading his farm. Several people began dropping of dishes of food just off-property in the summer and would return to find them destroyed. Luschinski said she's taken in eight kittens from the property this year alone. She is happy the city descended on the farm. "I couldn't be happier, to tell you the truth, because it's very hard to sleep at night knowing these animals are out here suffering," she said. The vet assigned to inspect Kucas's animals concluded in June that Kucas's pigs and cows all appeared to be in good health, as did the cats. He said he's been called to the property a few times over the years and the animals have always been in good shape. Some area residents say they've seen dead or injured cats near the busy road as well as escaped livestock periodically running loose. Paul Meunier has lived nearby with his wife and kids for 20 years and says the property has always been a mark on the "comfortable" and quiet neighbourhood. "When you drive up and down the street you see a lot of properties for sale, and one just south of here, they had to drop their price because it wasn't selling," he said. "It's just a bit of an eyesore and I am glad the city is finally attending to it." Eric Hogue, who considers Kucas a friend, said he feels sad but it was probably time the farm was cleaned up. He said "it's bittersweet" and is worried for Kucas's safety. "This house is about to collapse. Carl's safety is at risk. That thing is rickety," he said, pointing at the dilapidated home. "It has become an eyesore over the past 20 years for the neighbourhood itself. I've seen the decline." Hogue sympathizes with Kucas, who raised a family and has been farming there for about 45 years. "The city has grown around him, and he just kept where he is," he said. "He was happy like this. He would be no happier than just leaving it as is. "I think it's time that this is ordered condemned, flattened, Carl moves into a nice place and that's that. But I don't know what's going to happen." Kucas said he has been attempting to get a building permit for months but the city hasn't granted him one yet. "And they want to take that away from me. They want me to live between two boards," he said. He maintains he loves and cares for his animals. Kucas said he intends to spend the winter in a small white shack on the property. In the summer, the city warned him it would put his property up for tax sale if he didn't pay off outstanding property taxes. He paid down enough of the bill to prevent that from happening, the city confirmed this fall. It's unclear when the current home will be demolished or what will happen to his animals. Kucas's lot is classified as rural-residential. Typically that designation doesn't allow landowners to keep livestock, but Kucas has retained rights to do so since he bought the land in the 1970s, a city spokesperson confirmed.